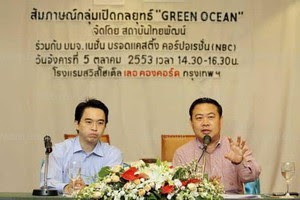 Thaipat Institute, a nonprofit organisation, is joining up with the Nation Broadcasting Corporation (NBC) to launch the Green Ocean Strategy, under which corporations will be encouraged to help support the environment and society for sustainability. In the first phase, the NBC will use its strength in conventional, new and social media to forge cooperation between business, media, academic and social organisations. "We're ready to mobilise our resources to distribute environmentally friendly news to society and raise awareness of the Green Ocean Strategy so it's a winwin situation for all," Adisak Limprungpatanakij, president and CEO of NBC, said. NBC is a subsidiary of Nation Multimedia Group. Pipat Yodpruditikan, director of Thaipat Institute, told the press yesterday that the Green Ocean Strategy would focus on moderation, in that companies will be encouraged to seek profits with business practices that are friendly to the environment and society. Green Ocean's precursor was the Red Ocean strategy, which focused on profitability, and the Blue Ocean scheme, which offered new business territories for companies to tread on so they could avoid fierce competition. However, players in the Blue Ocean are no longer protected owing to competition from businesses that are no longer inferior in terms of innovation and technology. To Pipat, the moderate path, guided by corporate social responsibility, is the answer to sustainability. "The Blue Ocean Strategy is the third factor consumers consider, apart from price and quality, when they pick up a product," he said. The strategy emphasises green governance based on resource and product efficiency, accountability as well as green habits that encourage one and all to rethink, reduce, reuse, recycle, recondition, refuse and return.